Applications for U.S. house mortgages surged 25.5 percent in the week ended October 2nd, 2015, rebounding from a 6.7 percent fall in the previous period and posting the highest gain since-mid January as many applications were filled prior to the TILA-RESPA regulation took effect on October 3rd, introducing changes to the mortgage process. In addition, fixed 30-year mortgage rates averaged 3.99 percent, the lowest in five months. Refinancing applications soared 24.2 percent and purchase applications went up 27.4 percent. Mortgage Applications in the United States averaged 0.54 percent from 2007 until 2015, reaching an all time high of 49.10 percent in January of 2015 and a record low of -38.80 percent in January of 2009. Mortgage Applications in the United States is reported by the Mortgage Bankers Association of America. Mortgage Applications measure the change in the number of new applications for mortgages backed by the Mortgage Bankers Association during the reported week. Mortgage applications include both refinancing and home purchasing. This page provides – United States MBA Mortgage Applications – actual values, historical data, forecast, chart, statistics, economic calendar and news. Content for – United States MBA Mortgage Applications – was last refreshed on Wednesday, October 7, 2015. This entry was posted in Katonah and tagged Katonah NY Homes, Katonah NY Homes for Sale, Katonah Real Estate for Sale on October 7, 2015 by Robert Paul. This entry was posted in Katonah and tagged Katonah Homes, Katonah Luxury Real Estate, Katonah NY Homes on June 24, 2015 by Robert Paul. More than half, 56 percent, of the 3.3 million Home Equity Lines of Credit scheduled to reset over the next four years with fully amortizing monthly payments replacing interest-only payments are on properties that are seriously underwater, according to a new report from RealtyTrac. With no equity remaining in the Bubble-era HRLOCs, the risk is high that the resets will trigger widespread foreclosures as owners struggle to meet the higher monthly payments. A total of 3,262,036 HELOCs with an estimated total balance of $158 billion that originated during the housing price bubble between 2005 and 2008 are still open and scheduled to reset between 2015 and 2018. Of these, 1,834,588 (56 percent) are on residential properties that are seriously underwater, meaning the combined loan to value ratio of all outstanding loans secured by the property is 125 percent or higher. “Homes purchased or refinanced near the peak of the housing bubble between 2005 and 2008 are much more likely to still be underwater despite the strong recovery in home prices over the last three years,” said Daren Blomquist, vice president at RealtyTrac. “Furthermore, many homeowners with HELOCs who have positive equity likely already refinanced to mitigate the payment shock from a resetting HELOC — an option not readily available for homeowners still underwater. With 645,872 HELOCs scheduled to reset over the next four years, California led the way among the states in terms of sheer volume of resetting HELOCs. A total of 423,706 (66 percent) of those resetting HELOCs in California are on homes still seriously underwater, and the average monthly payment increase on HELOCs resetting in California over the next four years is $215. Florida had the second highest number among all states of resetting HELOCs over the next four years, with 513,229, followed by Illinois with 158,199. In both Florida and Illinois, seriously underwater homes backed 71 percent of the resetting HELOCs over the next four years. Texas had the fourth highest number of resetting HELOCs with 158,017 over the next four years — 36 percent of which were on seriously underwater homes, and New Jersey had the fifth highest number of resetting HELOCs with 145,312 over the next four years — 47 percent of which were on seriously underwater homes. This entry was posted in Katonah, Lewisboro and tagged Katonah Luxury Real Estate, Katonah NY Homes, Lewisboro Luxury Homes on March 9, 2015 by Robert Paul. Fed up, the couple met with interior designer Kelli Kaufer. After several conversations about their likes and dislikes, they handed the reins over to Kaufer. “We basically said, ‘We trust you. 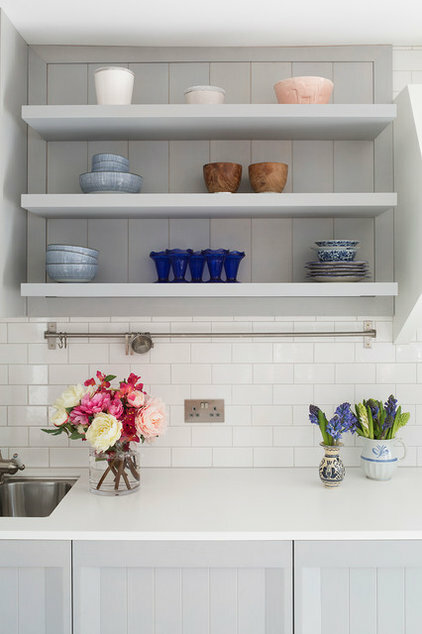 Build a kitchen that you think suits us,’” Ian says. AFTER: They gutted everything but left the plumbing where it was to save money. Kaufer interpreted the couple’s personalities — he’s a bass player; she’s a digital artist — into a design that channels modern urban hipness with a vintage feel. 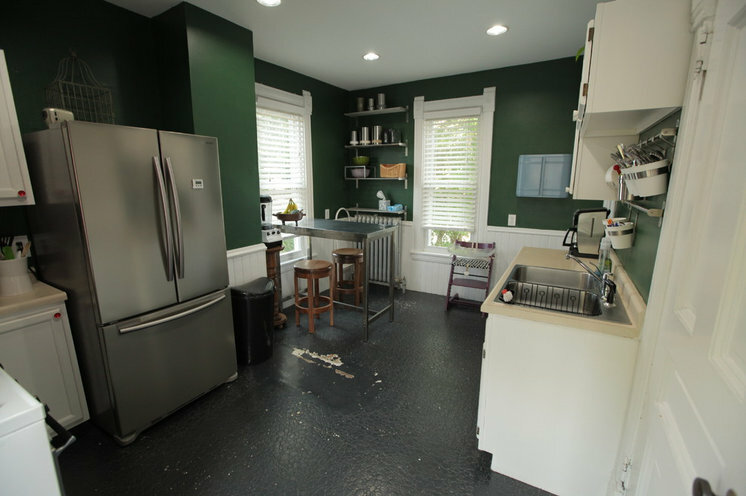 For example, repurposed bleacher seats form the honey-colored lower cabinets, while old schoolhouse chalkboards make up the countertops. 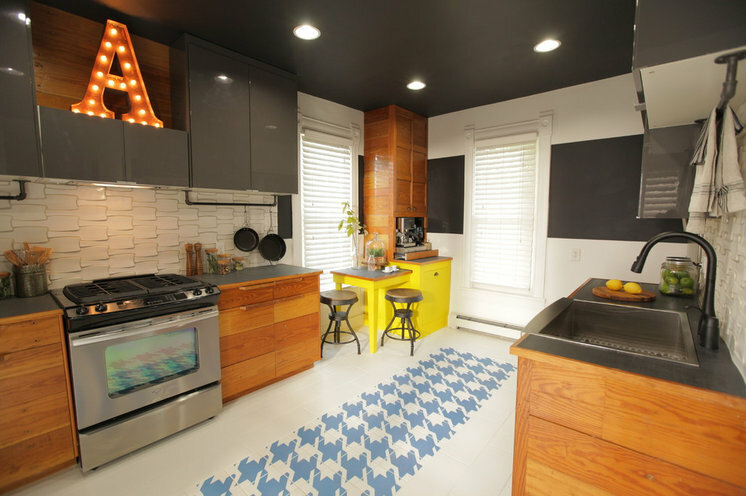 There are also a black ceiling, pops of color and a funky, graphic floor pattern. But, above all, there’s finally function. “It looks like us, it’s functional, and it’s a delight to be in,” Ian says. 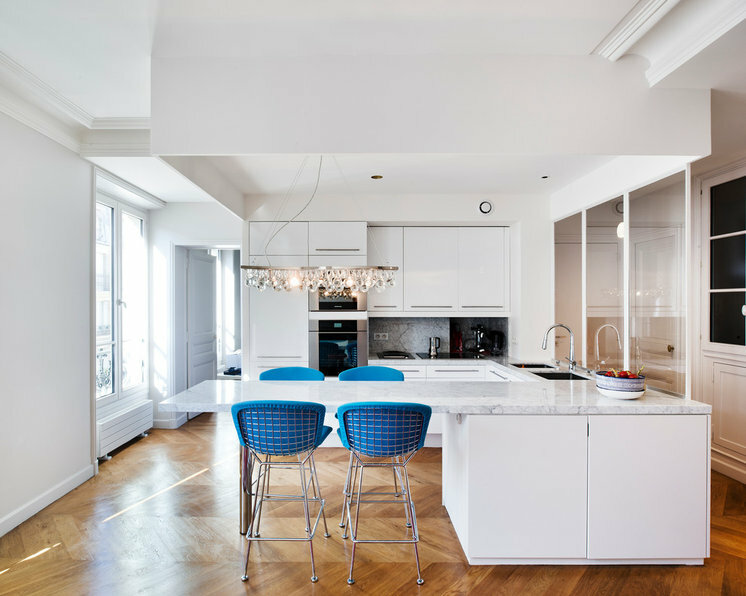 Flat-slab upper cabinets deliver a dose of modern, and the flooring plays on an old houndstooth print that’s been around for a century, Kaufer says. She enlarged the pattern and printed it in a funky color on tiles.She then painted the ceiling black as a visual trick that forces the eye up and makes people pay attention to the whole space. This entry was posted in Lewisboro, Westchester NY and tagged Katonah Homes, Katonah Luxury Real Estate, Katonah NY Homes on January 21, 2015 by Robert Paul. A much higher proportion of renters than homeowners are cost burdened by their housing expenses and the number is growing quickly due to rising rents and affordable home prices. Last year, 39.6 million households spent more than 30 percent of their income on housing, down from 40.9 million in 2012 and a peak of 42.7 million in 2010. Still, just over a third of U.S. households (34 percent) were cost burdened in 2013, including about a quarter of all homeowners (26 percent) and half of all renters (49 percent), according to the Harvard Joint Center for Housing Studies. Last year’s decline in the number of cost-burdened households, however, occurred almost exclusively among homeowners. Cost burdened households are those where housing costs exceed 30 percent of income. Nearly 19 million owners were cost burdened in 2013, down from 20.3 million in 2012. The number of owners with severe cost burdens – paying more than 50 percent of income for housing – also slid, from 8.5 million in 2012 to 8.1 million in 2013. The easing of owner cost burdens is due in part to a dramatic decline in median homeowner housing costs. After surging during the housing bubble, inflation-adjusted owner costs have dropped to about 2.5 percent below their 2001 level (Figure 2). Owner burdens are also down due to a significant reduction in the overall number of homeowners – fully 294,000 fewer households in 2013 than 2012. This decline in the number of homeowners for the third straight year (and the fifth time since 2007) suggests that many burdened owners dropped out of ownership, moving into the costly rental market. This entry was posted in Katonah, Lewisboro and tagged Katonah Homes, Katonah Luxury Homes, Katonah NY Homes on December 2, 2014 by Robert Paul. Privately-owned housing starts dropped 2.8% in October to print at a seasonally adjusted annual rate of 1,009,000 units, which is still 7.8% above the October 2013 rate of 936,000. Single-family housing starts, which have been lagging through the summer and fall, finally perked up, growing 4.2% from last month’s tepid performance. This comes one day after the National Association of Home Builder’s monthly survey said builder confidence is up for November. Notably the only region with gains in starts was the South, which saw an increase of 10.1%. The West saw a drop of 10.9%, the Northeast dropped 16.4% and the Midwest plunged 18.5%. “While permits rose in October, starts declined on weakness in the multi-family sector. Still, following yesterday’s rise in the NAHB Index, there appears to be a significant amount of confidence amid home builders breaking ground on new projects as low financing costs and improvement in the labor market are expected to bring new demand for housing,” said Lindsey Piegza, chief economist for Sterne Agee. “While there has been improvement in sales since a weak start to the year, demand has hardly been robust. Minimal income, lackluster savings, and more stringent borrowing restrictions are in some cases outweighing historically low borrowing costs. “After a surge in buying activity in mid-2013 sparked by the Fed’s taper talk, demand slipped noticeably and has since been unable to recapture the highs of 2013. In the end, without jobs and income growth, consumers remain restrained, translating into positive, but modest demand,” she said. Privately-owned housing units authorized by building permits in October were at a seasonally adjusted annual rate of 1,080,000, which was 4.8% above the revised September rate of 1,031,000 and is 1.2% above the October 2013 estimate of 1,067,000. Paul Diggle, property economist for Capital Economics, was optimistic in his outlook. The permits level is also the highest since June 2008. Single-family authorizations in October were at a rate of 640,000, which makes for a 1.4% gain on the revised September figure of 631,000. This entry was posted in Katonah, Lewisboro and tagged Katonah Homes for Sale, Katonah NY Homes on November 20, 2014 by Robert Paul. The Skinny: Several homes in the northeastern Columbus suburb of Westerville, Ohio, were stations on the Underground Railroad. One of them, an updated five-bedroom with a spiffy columned facade, some beautiful mounted panels rescued from the LeVeque Tower, a Jeffersonian-looking dome topped with a skylight, and a 1930s schoolhouse outfitted for guest accommodations, was put on the market just the other day. The oldest sections, which were built in 1830, according to the marketing material, have a healthy amount of exposed brick that’s since been balanced out by large windows and glass doors in the rear of the home. Much of the yellow pine and walnut woodwork is original, and there’s vintage tiling in a few of the bathrooms. With a pool and an expansive brick patio, facing out on a about five acres with “mature trees & landscaping,” this handsome historic hodgepodge is priced at $1.25M. This entry was posted in Katonah, Lewisboro, Westchester NY and tagged Katonah Homes, Katonah Luxury Real Estate, Katonah NY Homes on November 5, 2014 by Robert Paul.